Morning exercise to recharge your batteries! Japanese radio callisthenics were born in 1928 and have been performed in schools and workplaces ever since for building HEALTH. 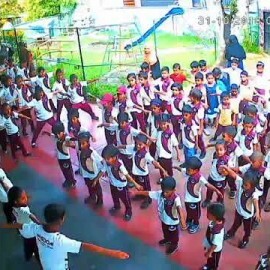 The programme is also used to build a sense of COMMUNITY in neighbourhoods, where the exercises are performed all together by young and old alike. So what is the appeal of radio callisthenics and why, given they were inspired by the exercises broadcast on American radio in the 1920’s, do they endure into the 21st century? In a nutshell, they are simply exercises set to a musical radio accompaniment. Every morning an instructor and music will guide you through the movements. It is a workout that practically every Japanese person knows by heart, having learnt it from a very young age. It is an extremely popular form of exercise in Japan and it is estimated up to 10 MILLION people practice it regularly. It is not quite as common as it was (with some seeing it as quaint piece of nostalgia), but that is as much to do with what killed off the original American version in the 1930’s – competition & new ideas. The value of the exercises has not changed. The benefits have not changed. It is culture that has changed. That is slowly starting to change back however, as its many health benefits are once again championed. What are the fitness benefits of these exercises? The primary benefit is that they put joints through their full range of possible motion. In most daily life, joint movements usually fall well short of their full range of motion, so muscles can gradually shrink. Simply put your body through a full range of motion every day and you can see how obvious it is that you will keep ‘working better’ for longer. The exercises can also improve agility and posture which can in turn help with simple things like getting up from a chair, or getting down onto the ground. Furthermore, gentle exercises such as these in the morning gets the blood flowing around your body, which in turn will energise you, loosen your joints and get rid of accumulated stiffness. Does this mean all Japanese people are fit? Under 4% of Japanese people are considered ‘obese’, and while there are of course many factors at play here, the fact so many Japanese take part in a daily exercise routine surely must play a part. Also a great many Japanese people remain ‘fitter’ for longer – i.e. keeping functionally active well into old age. Again, a lifetime of performing stretching and movement based exercises is a likely piece of the puzzle. Personally I don’t bother with the music (I prefer my own), so don’t let that put you off.